Yogi's Hideaway offers the best in luxury, relaxation and things to do! If you're looking for a romantic retreat for two or an exciting family getaway, Yogi's is the place to be! You're only steps from popular Bear Creek Trail as well as Pinhotti Trail where hiking and biking is a favorite! Yogi's is nestled in a beautiful setting surrounded by the Chattahoochee National Forest. With your own private tennis court complete with basket ball goal too, there is always something to do at Yogi's! After a fun filled day of activity, enjoy a luxurious soak in the hot tub or a massage in the outdoor living area in front of a roaring fire. This outdoor space is perched in the tree tops and is one of the highlights of this property. There is also a small stocked (catfish) pond on the property for your enjoyment. Lake Conasauga, the highest lake in Georgia at 3,150 feet above sea level is only 14 miles from the cabin and provides a place for swimming and picnicking as well as Fort Mountain State Park which is 11 miles from the cabin. Choosing Yogi's as your getaway destination is not only a smart choice but one that you will enjoy making memories at for years to come! Linens for each bed, (2) bath towels (1) hand towel (1) washcloth per person listed on reservation, dressers or closets for clothing storage, central heat & air, vacuum and/or broom and dust pan, mop, cable or satellite TV, internet, telephone for local calls. Amazing stay. Cozy cabin with incredible outdoor space that made us get outside and play with the dogs and our kids and their friends (ages 15, 16, 21, & 25) Everyone stayed busy outdoors - playing basketball, going in the hot tub, making smores on the outdoor fireplace, walking around the pond and beautiful creeks, letting our city dogs run and play off leash and even had a fierce tennis match. Inside we cooked, played monopoly, watched a scary movie, did a puzzle, and enjoyed the fireplace. We ventured out each day to the falls above the cabin, another waterfall that was quite a drive away, had a picnic at the falls, and visited a local animal sanctuary and got to pet and hold baby goats, donkeys, horses, chickens, etc. It was truly an amazing family vacation. Beautiful home!! Had everything we needed and then some. Games, movies, pool table, tennis court, basketball, jacuzzi, and hiking trails close by. Very clean, beds were comfortable, nicely decorated and pet friendly! The only reason property did not get a 5 was because of some ants in the kitchen. Overall we thoroughly enjoyed our stay at Yogis Hideaway. There was plenty of room and lots to do right there at the house. We enjoyed walking the property, feeding the fish in the pond and playing out on the tennis court. The pool table and hot tub were a huge hit. The kitchen had everything we needed to be able to cook and access to the washer and dryer was great! Thanks for everything!! Yogi's Hideaway was everything described and more. The interior is even better than the pictures. We were able to ride our mountain bikes to Pinhoti 1 trail right from the cabin! The kitchen was well stocked. We cooked most of our meals and had plenty of pots and pans and serving dishes. The cabin was very clean and the beds were comfy. The outdoor covered deck was a perfect place to relax after a long day of riding. We even played a set of tennis on the courts outside. If you are looking for a nice relaxing getaway, this is your spot. I would highly recommend! We loved Yogi's Hideaway! We will be back! The reservation process was easy, any questions we had were answered promptly, the cabin was immaculate, the amenities outstanding. Thank you!!! Yogis is our happy place! On the last day as we drive away we feel sad to say goodbye until the next trip. Great place. Clean and comfy. No problems at all. Sweet place. Loved the tennis court, central location for mountain biking, and relative seclusion. Such a great little getaway! Everything was perfect! Although our visit was cut short due to a family emergency, Debbie at mountain oasis cabin rentals treated us like family and not like a number. This day and age it is truly amazing to have had such kind caring attention given to as during and after our emergency. I have never seen the likes of a company with such integrity and honor. If there were more companies like mountain oasis cabin rentals traveling on vacation would be a effortless experience. Booking the cabin was easy, the staff gave as plenty of choices based on what we were looking for during our stay. Offered plenty of ideas of things to do while we were in the mountains. And we were very pleased with how easy it was to find the cabin. And most importantly the cabin was as beautiful In person as it was on the website. We look forward to many more years booking our anniversary vacation with mountain oasis. Thank you from the bottom of our hearts for taking such good care of us. We had a very nice stay at Yogi's Hideaway. The location was perfect to hiking Bear Creek, Pinhoti, Consanauga, Mountain Creek, Emery Creek and many other trails in the area, all beautiful. The deck and the hot tub were amazing. Booking was easy, the direction to the cabin was spot on, and it was wonderful to go straight to the cabin with the lock box rather than having to drive somewhere to check in and out. Having the lights on, the hot tub ready and the music playing when we arrived was an amazing welcoming touch. The kitchen has all the dishes, glasses, pots and pans that we ever needed. The toiletries, abundant soft, fluffy towels and availability of hot tub towels were wonderful. Thank you for your prompt response and attention when we had a minor issue. We really enjoyed your place. Thanks for much for the lovely stay. This was our second time at Yogis Hideaway and it was again delightful. Thank you for being pet friendly! We love hiking with our dogs and so enjoy the easy walk to the hiking trails. 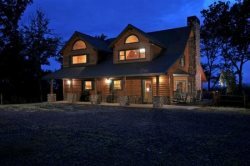 The home is perfect for our group of women who like to hike, cook and converse. Weather was perfect to use the lovely outdoor room. Thanks again for a great stay. Our experience with Mountain Oasis Cabin Rentals has been so easy and efficient. The booking process was smooth, the office staff was well informed and replied quickly to my questions. We stayed at Yogi's Hideaway for a long weekend for a family wedding and are so impressed with the cabin and it's amenities. The place was spotless, beds were comfortable, and the kitchen was the most well-equipped kitchen I've ever seen. Really good experience all around.